I just added two brand new composer lapbooks to my shop! Tchaikovsky arrived at music as a career a bit later in life. We listened to excerpts from his most famous works, of course including the wonderful Piano Concerto No. 1 and the three ballets he composed: Swan Lake, The Sleeping Beauty, and The Nutcracker. These are two of the four composers my students and I studied this summer during my 2017 “Music History Blast From The Past” camp (see the photos here). Sometime next week, I will have the other two new composers lapbooks listed in the shop. Stay tuned! I just looked it up: Can you believe that I’ve offered a “Music History Blast From The Past” 4-day camp every single summer since 2012? I love offering this camp because I think that it’s so important for students to be exposed to great classical music and gain an sense of how music styles have evolved across the centuries. This experience is so helpful, especially as students begin playing classical repertoire at the intermediate levels. And they always enjoy learning about the composers’ lives, especially in a group setting. Anyway, as I said: Stay tuned for the announcement sometime next week about two more new composers! 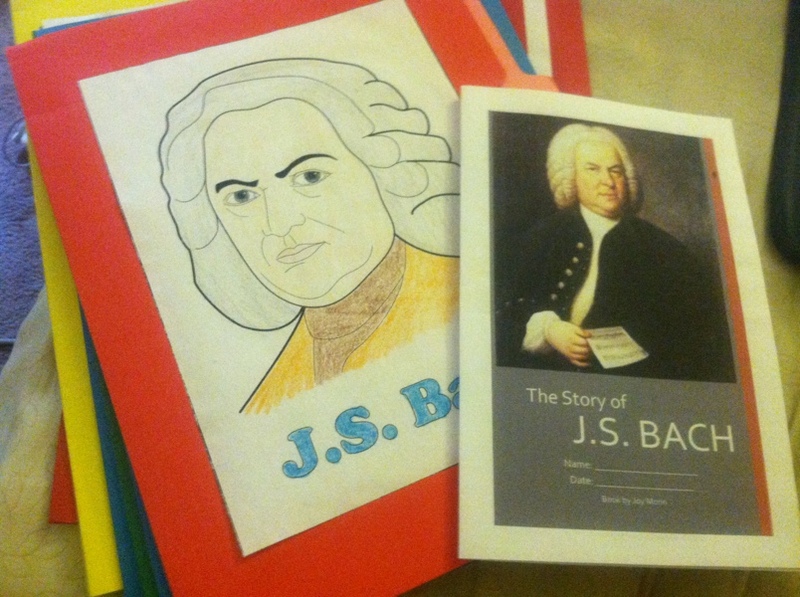 Learn more about the Great Composers & Their Music lapbooking curriculum here. In my music theory classes, one of my goals was to cover as many areas within the broad scope of “music theory” as I could. The gem stones activity covered 5FPs/scales/key signatures; the rhythm dictation game covered rhythm and ear training, and the Hear & Sign game covered more ear training. This game, called “Music Adventures,” focuses mostly on music terminology, but also on note reading and identifying intervals. You may recognize this game from the picture on the right: I created this piano-bench-sized board game earlier this year, and it is available for download on the Printables > Other Resources page. To prepare for this game, we first quickly reviewed some music terms on the chalkboard. Then I set the students loose in teams of 2 to play this music board game. You can vary the length of this game by using either one die or two dice. I had lots of things I wanted to do in my 30-minute classes, so I gave each team two dice. We played this game one time, on the second day of camp. I used Susan’s Music Bingo game at a group lesson about a year ago and it was a huge hit, and I thought this was a good opportunity to use it again! I used this game on the last day of camp, and it was quite a fun way to end the day. Stay tuned – there is one more post about our music theory activities coming soon! As promised, here’s more about the Music Theory classes at our Piano Mini-Camp a few weeks ago. I didn’t create formal lesson plans per-se, but the next three posts will serve as a general outline of the activities we did over each of the three camp days. Using Susan Paradis’ wonderful resources, I created an activity for teaching 5-finger patterns (5FPs) and scales. We used colorful glass stones (from the dollar store) to build 5FPS/scales on her table-top keyboard printable and one of her grand staff printables. After printing everything out on cardstock, I cut out the table-top keyboard so that the students each had one long keyboard and then put each grand staff in a sheet protector. With the younger students, we learned just about 5FPs: how to build them (WWHW) in various keys, and how to make them minor (lower the 3rd). With the more advanced students, we learned about the entire scale (WWHWWWH) in various keys, and how to make them minor (lower the 3rd, 6th, and 7th for natural minor). We first created the 5FP/scale first on the keyboard (pictured above), and then created it on the staff. The reason I had the student do both is because I think students sometimes fail to make the connection from the keyboard to the staff and vice versa. I intended this activity to be a way to build their understanding of the connection between their playing and what they see on the staff when it comes to 5FP/scales. In order to notate a sharp or flat on the staff, we used different shaped gem stones (which I also found at the dollar store): an oblong shape. I’m sure you could also just use the different colors to represent the notes with accidentals. We spent about 10-15 minutes each day on this activity. Each day, we reviewed what was covered the previous day and then added something new to the process (like learning about minor) or tried out other key signatures. On the first day of camp, I started each theory class with another Susan Paradis activity: Make A Keyboard. I strongly recommend printing this printable onto cardstock paper so it will last longer. I chose this activity mostly as a warmup activity to get their minds working before moving on to more complex activities. But it’s a good activity to see whether the students remember how the keyboard is laid out without looking. One student had all her black keys in groups of two at first, and couldn’t figure out why she had extra black keys! I handed each student a small zipper bag with all the piano key pieces inside and told them to “make a keyboard.” This activity took less than 5 minutes to complete. It worked very well as an opening activity! 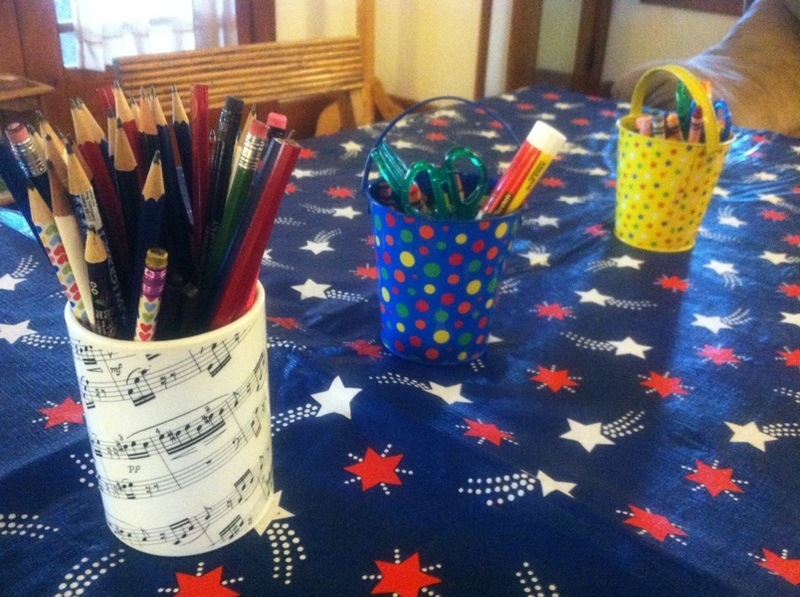 Stay tuned – more music theory activities from our mini-camp are coming soon! Meanwhile, check out the recent responses to the July Forum topic about piano method books and be sure to contribute your thoughts! Each day at our piano mini-camp, we opened the day with an opening activity that involved all 11 of the campers together before sending them off in their individual groups to their first class. The second day, we played a rhythm name game to help the students learn each other’s names. Here is the link to the game we played. We found that it was a little bit complicated to be doing complicated body percussion while chanting, so I would recommend simply clapping or tapping one’s thighs to the beat. On the final day, we made egg shakers which the students could decorate and take home. We filled plastic easter eggs halfway with rice (or however much the student desired to create the sound they wanted) and taped them closed with colored electrical tape (strongly recommended over glue). The students then added stickers. My egg shaker is pictured at right. I was able to incorporate the egg shakers into my Music Theory class during a dictation game so they could put them to good use! More information about the activities we did in my Music Theory classes coming soon! We planned to hold the camp on Tuesday, Wednesday, and Thursday from 12:30 – 2:30pm. Application forms were sent to all the piano teachers who are members of our local chapter of MTNA and Michigan MTA. We charged a fairly low rate, to encourage more participants. Location: my piano professor’s church, where there are a number of nice pianos and plenty of rooms for us to use — at no cost to us. We received applications from 11 students. The students ranged in age from 7 years to 13 years old. 12:30 – 12:45 Opening activities (all campers). The snack each day was different, consisting of items such as pretzels, fruit snacks, goldfish crackers, and juice packs. Nothing too sugary or expensive! We were very careful to keep our expenses low. Snacks were our largest expense; the rest were simply a few craft supplies needed for games/activities. The camp was quite a success! Our campers had a great time. A few of the parents even asked if we would be holding camp again next year. Stay tuned — I’ll be sharing more about the opening activities we used and more about my Music Theory class soon!